This meatloaf is TASTY! 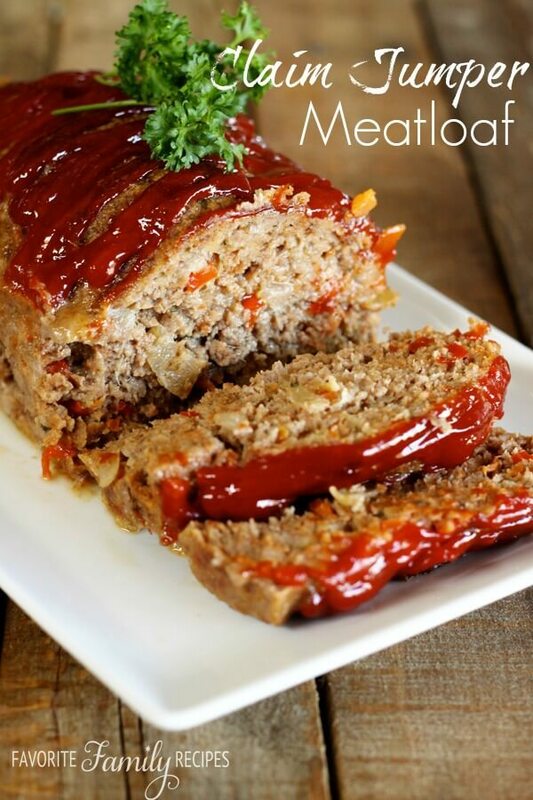 I’m not even a huge fan of meatloaf, but this is GREAT! I have only been to Claim Jumper a handful of times. The last time I went, my husband got the meatloaf and I got.. I don’t even remember.. all I remember is how good the meatloaf was! He gave me a bite or two of it and I was wishing that I had ordered it too. It had so much flavor! I knew that I needed to go home and combine some recipes to try to duplicate it. I think I got pretty dang close! This is our take on the Claim Jumper Meatloaf recipe (which is a combination of our own recipe and Todd Wilbur’s recipe)… it is actually really easy to make– you are going to love it! Preheat oven to 350 degrees. Saute onion, garlic, green pepper and carrot in oil over medium heat until they become soft. Combine eggs with milk, salt, pepper, garlic powder, and onion powder in a medium-sized bowl. In a large bowl, mix breadcrumbs and flour into the beef and pork with your hands. Add egg and milk mixture, sauteed veggies, ketchup and mix it up with your hands. Press the mixture into a meatloaf pan or a large loaf pan. Bake for 30 minutes, then spread about 1/4 c. ketchup over the top of the loaf, then bake for another hour. Let it sit for a few minutes, then slice and serve! This was so good! Very easy to make, and the whole family really enjoyed it. Your recipes rock!! I love your recipes, but how can you not make a meatloaf without onions? I see you have one green onion minced, but it cannot substitute for a yellow, red or white diced onion. I agree on the onion, I’ve always put in a medium chopped one and also more green peppers. I don’t see any response from the author? How much catsup do you mix in the actual meatloaf besides the 1/4 cup on top?